5 Bedroom Detached House For Sale in Yeovil for Asking Price £575,000. 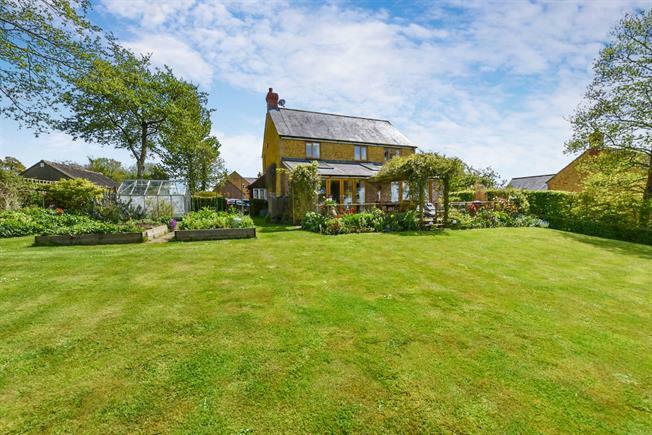 Malvernia is a beautifully presented, rural, detached Hamstone family home close to West Coker which benefits from living room with log burner, spacious Kitchen/Breakfast Room with Granite worktops opening into the dining and sun room taking advantage of the panoramic view. In addition the ground floor offers cloakroom, study, utility room with door to boot room and double garage. The first floor offers Master bedroom with en suite, second bedroom with dressing room/living room and en suite bathroom, two further double bedrooms and a family bathroom. The rear of the property offers patio off of the dining and sun room, beautiful views to the rear with Pergola above, good size lawn which are fully enclosed, vegetable patch and green house. The front of the property offers gravel driveway leading to double garage. The property further benefits from oil central heating and double glazing. Open plan leading to sun room, radiator, wooden flooring, log burner with exposed brick surround and stone hearth. This light and airy addition pulls the living room, kitchen and dining room all together. This area benefits from plenty of natural light from Double glazed windows to the side, three double glazed Skylights, two double glazed French doors leading to patio and rear garden. The sun room has been position perfectly to take advantage of the breathtaking views over the countryside. Double glazed window to the rear, low level WC, wash hand basin and radiator. Perfect for a home office, double glazed window to the front, carpet flooring and radiator. Double glazed window to the rear, door leading to boot room with access to the double garage and courtyard which has space for timber shed and leads to brick built greenhouse. The utility room has plumbing for washing machine and space for tumble dryer. Dual aspect windows to the side and rear which offers stunning views, carpet flooring, built in wardrobe, door leading to ensuite and radiator. Double glazed obscure window to the rear, walk in shower, heated towel rail, vanity unit with low level WC and wash hand basin. This room offers versatile living as a second bedroom with dressing room and ensuite bathroom. These rooms could be perfect as an annexe, rental opportunity or as the master bedroom. The room benefits skylights, built in cupboard and storage, carpet flooring and radiator. Double glazed window, panelled bath, low level WC, and wash hand basin. Double glazed window to the rear with countryside views, carpet flooring, radiator and built in storage. Double glazed window to the rear with far reaching views, carpet flooring and radiator. Double glazed window, panelled bath with shower above, tiled splash backs, low level WC and wash hand basin. Gravel driveway for a number of cars leading to double garage with electric up and over door, access to the utlity room, light and power. The rear of the property offers great size for a family home and perfect for entertaining in the summer months. There is a large patio off the back of the sun room and dining room which is great for entertaining guests with a Pergola above, steps down to the large lawn garden which wraps round to the side and is fully enclosed with hedging. To the side of the property there is gated access to the parking, two vegetable patches and a greenhouse.